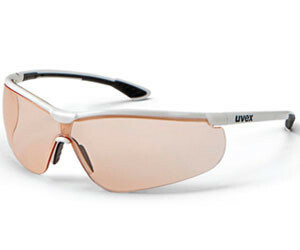 These lightweight safety spectacles have a supravision excellence coating, making them anti-fog on the inside and scratch resistant on the outside. What does ‘CBR75’ stand for? C = Contrast enhancement; B = Blue light reduction; R = Relaxed vision. The ‘C’ denotes improved contrast, giving clearer vision, reducing strain from harsh light or reflective surfaces and increasing comfort, making this lens suitable for most light conditions, and enabling wearers to focus on the task in hand safely without distraction. The ‘B’ indicates blue light reduction; this can be reduced by up to 40% at 450 nm rendering the CBR75 lens suitable for screen work and for use in bright, harsh, unnatural light. The ‘R’ signifies a relaxed comfortable vision, with 75% transmission of light, making the lens suitable for tasks with high visual requirements such as close inspection, outdoor work or tasks that require high levels of concentration, where eye fatigue may become an issue. The CBR75 lens tint makes operating in the workplace with bright natural or artificial light much more comfortable, enabling the wearer to remain focused for longer without eye strain. 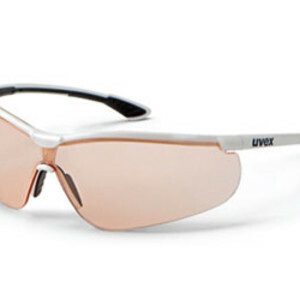 I am interested in uvex sportstyle CBR75 safety glasses .